Q: What does "Sali Guitars" mean? Sali Guitars means Tradition, Hand Making, Precision and Scientific Approach which all together reflect in the attractive appearance and beautiful sound of our instruments. Q: Is there only one model of Sali guitars? No. 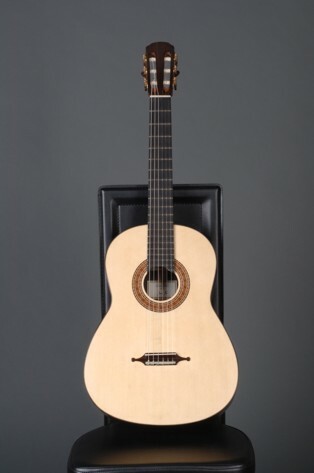 We produce 7 different models of guitars: Three classical concert guitars, one concert guitar for children, one 6-string acoustic bass (double bass guitar), one acoustic steel string guitar and one flamenco guitar. Q: What is the difference between these three classical concert guitars? Sali Classic and Sali Snow White (back, sides and neck are made of flamed maple) are very similar instruments, there is only a difference in physical appearance and in tone color which is "darker" for Sali Snow White in comparison to Sali Classic. Our latest model is Sali Double-Top which possesses all features of Sali Classic model and has incredible dynamic range for all tones in addition. Q: What is Sali Double-top? This model has "double-top" which in practice actually means that sound board is made of three layers: two extremely thin wooden boards (spruce or cedar) and nomex honeycomb in between. Nomex is artificial material made mostly of Kevlar. Therefore, double top guitars possess high strength, low mass and relatively high toughness which contributes to better sound radiation in comparison to instruments made only of wood. Q: Why is Sali Double-Top so special? The weight of the sound board and bridge is reduced to highest possible limit. This enables large vibrations in all frequency ranges and consequently in a loud instrument with extremely high response. Q: Is there any danger that Sali Double-top' sound board will break under string load due to its light structure ? No. Because of well considered design these models (as well as all models of Sali guitars) behave ideally in terms of sound board deformations due to string tension. Q: How do you finish your guitars? Sali guitars are finished with shellac which contains natural substances only. We leave the wood pores in hardwoods open (shellac is sprayed) in order to minimize sound losses whilst our sound boards have a glossy appearance due to French polishing technique. Q: Which type of strings do you recommend for your concert guitars? We recommend Savarez "Alliance Corum" strings. Q: How do your guitars behave under the hand, what is their playability? Our fingerboards on all guitars are designed and worked with engineering precision. Therefore string action is low at all frets. Consequently the playability and string buzzing are perfectly optimized. Q: Why would one possess Sali Bass, your acoustic bass guitar? This guitar is an excellent supplement for guitar orchestras and another ensembles. Sali Bass is designed to add important and exciting bass support in any kind of music genre. Q: Do you offer any warranty for your guitars? Yes. There is usual warranty within first three years for all defects which are without any doubt our responsibility. See more about this in Warranty. Q: I live far away from your place. What should I do in case that I need your service ? Please note that your local guitar maker is able to fix all necessary adjustments and repairs of your Sali guitar. In case that you do not like this option, you can send us your guitar if it is professionally packed to our contact address. If your guitar needs maintenance repairs (re-fretting, etc.) then you should cover all cost for shipping and repair itself. If you want to employ the warranty then we cover shipping costs back to you and costs for a repair itself, of course. Q: How should I take care of my Sali guitar? No particular care is needed for Sali guitars. However this does not mean that negligence is allowed; it is important to hold the guitar most of the time in environment with relative air humidity not less than 40% and temperature not more than 35°C. See more.